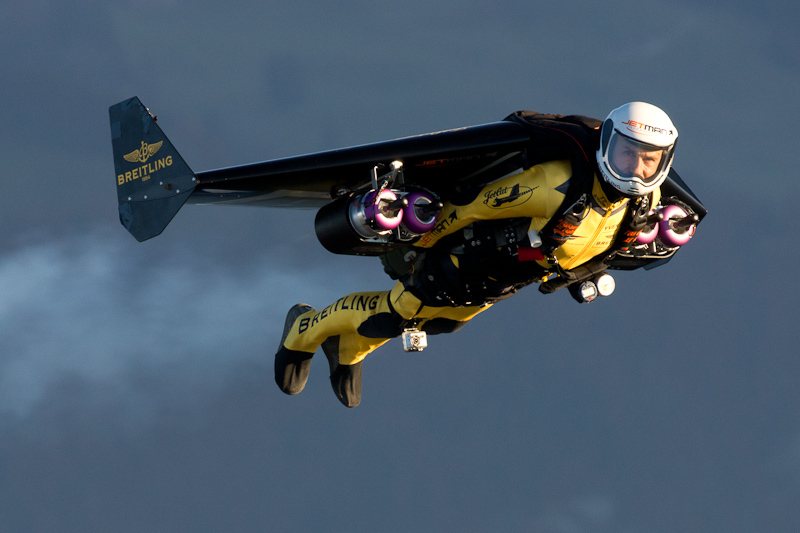 Jetman Yves Rossy, the first human to fly with jet-propelled wings, is internationally renowned for his pioneering flights over the Channel and the Grand Canyon. But the 2012 IMD Orchestrating Winning Performance keynote speaker drew a standing ovation not only for his exploits, but also for his wit and inspiring optimism. Rossy knew from the age of 13 that he would enter the world of aviation. He trained as a military pilot and then as a commercial pilot, a profession he still exercises today for Swiss Air International. But there was something about being encased in a ‘flying box’ that he didn’t like. He wanted to feel the wind. Rossy then described the step by step evolution of the wings that were going to allow him the freedom to which he aspired, with no steering, with just his body to guide the trajectory of the flight. Inflatable wings were followed by deployable rigid wings, and the introduction of model jet engines to power them. The test flights in 2004 and 2005 were promising, but did not always end the way they were supposed to. At one point he had to sacrifice the wings because he was descending too quickly. “Aviation is learning by crash,” he said. “You don’t make the same mistakes twice.” He took a break to figure things out. But by November 2006, he was ready again. That is when he made his true inaugural flight at Bex, above the beginning of the Swiss Alps. 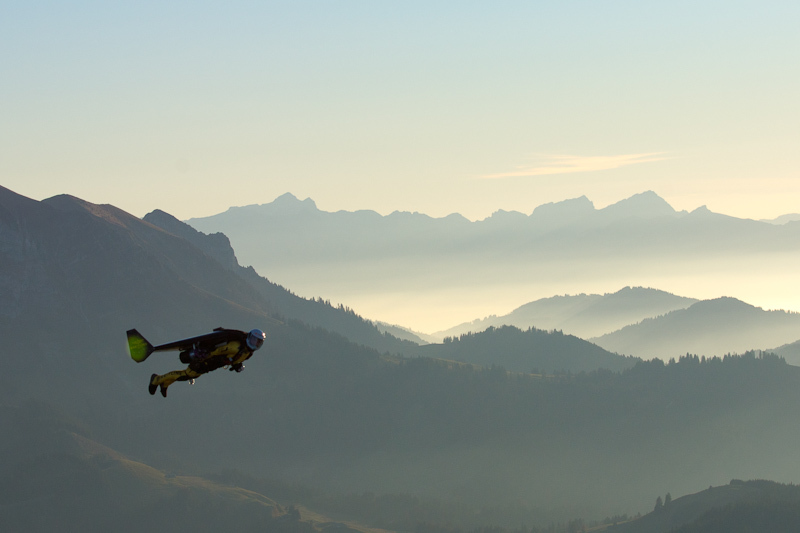 “These are the kinds of days I live for,” he said of the experience of flying in harmony with the mountains, steered only by the aerodynamics of his own body. The day following this success, Rossy contacted potential sponsors, but none were interested until Reuters television decided to do a documentary in December 2006. Hits on his website flared to 15,000 a day. Instead of a flight though the Grand Canyon that had initially been proposed by National Geographic magazine, the project to cross the Channel materialized. “It’s easy, it’s straight,” Rossy said with that touch of innocent irony that permeated his talk. The project almost ended in disaster, had not his friends, who constantly rally around him and that he considers paramount to his successes, told him that he was too focussed on himself and that he should imagine that they were all coming with him, under his wings. It did the trick. In September 2008, Rossy sailed through the air from France to the UK. He became a media phenomenon. The next moves were to gain enough mobility to do acrobatics, but still with only a throttle and an altimeter. Rossy’s body remained the air rudder. Finally it was time to confront the Grand Canyon. All the authorizations were in place, except the one from Washington, which arrived only 15 minutes before the flight was to take place. Rossy hadn’t slept the night before and he knew that if he went through with the flight, he would not feel in control. The flight took place the next day in perfect conditions. It garnered the attention of the world press and got Rossy on the cover of National Geographic. Another historic flight has taken place more recently, in May 2012, when Rossy circled above Rio de Janeiro, coming dangerously close to the symbolic statue of Christ the Redeemer. 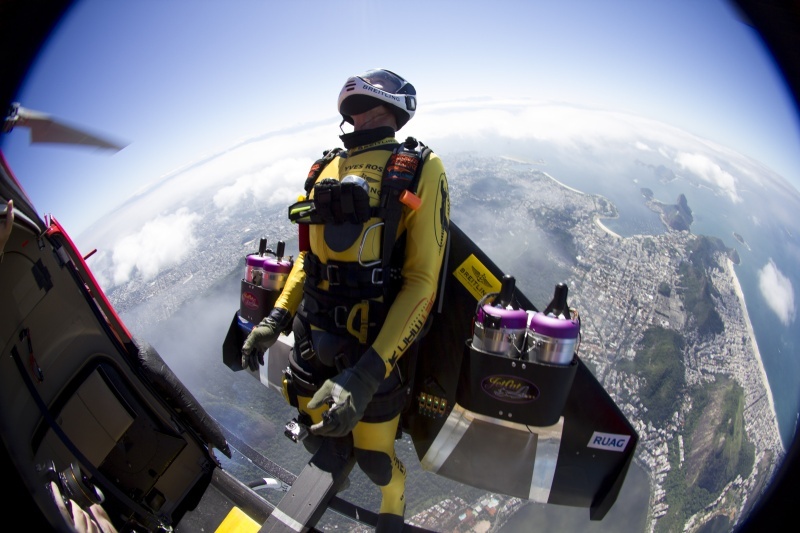 Yves Rossy, known as the Jetman, flies past Christ the Redeemer statue on Corcovado Mountain during a successfull flight over Rio de Janiero, Brazil, Wednesday, May 2, 2012. There is no holding Yves Rossy back as he continues to optimize the design of his wings and their performance, his only limitation being the amount of kerosene he can take relative to the total weight. His next ambition is to depart from a cliff, rather than a plane and his greatest motivation is to prepare the next generation of flyers. He would like to open a gliding school or find a way to commercialize his invention. There are 22kg of thrust per jet engine. 35kg are needed by Rossy to stay airborne. Rossy’s gear weighs 55kg when the kerosene tanks are full. Liquid oxygen and hydrogen are not options for inflammable reasons. In a straight line, Rossy’s flight can last 13 minutes and cover 40 km. When he does acrobatics, the time is reduced to 10 minutes. A gauge tells him how much fuel he has left. The equipped wings cost approximately CHF 100,000.